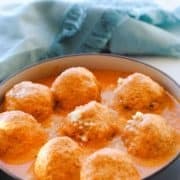 This malai kofta recipe is a vegetarian delight made of paneer and potato balls in a rich tomato gravy. Smooth, creamy, and oh so delicious! How do you make malai kofta? 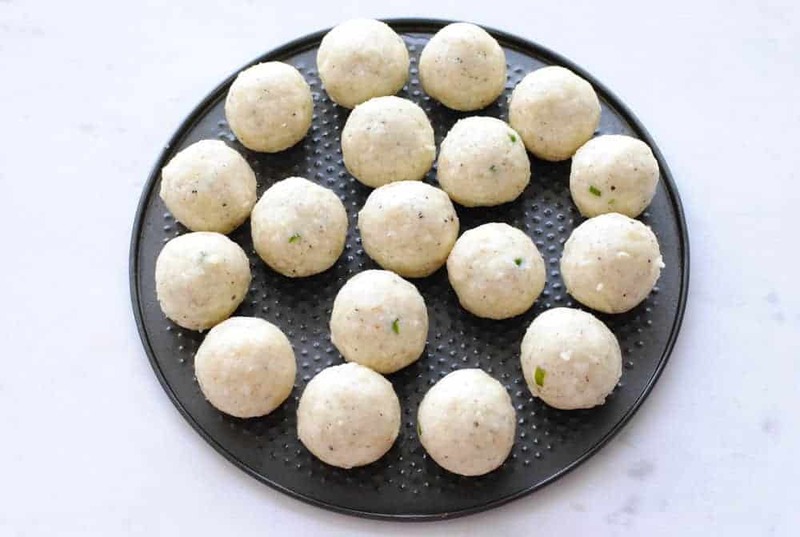 Making paneer malai kofta a four-step process: make the cottage cheese and potato balls, shallow fry them in some oil, make the curry and put it all together. Mix grated paneer, boiled and mashed potatoes, finely cut green chillies, white pepper, cardamom and salt. Shape into balls. Deep frying is certainly an option if you so prefer. 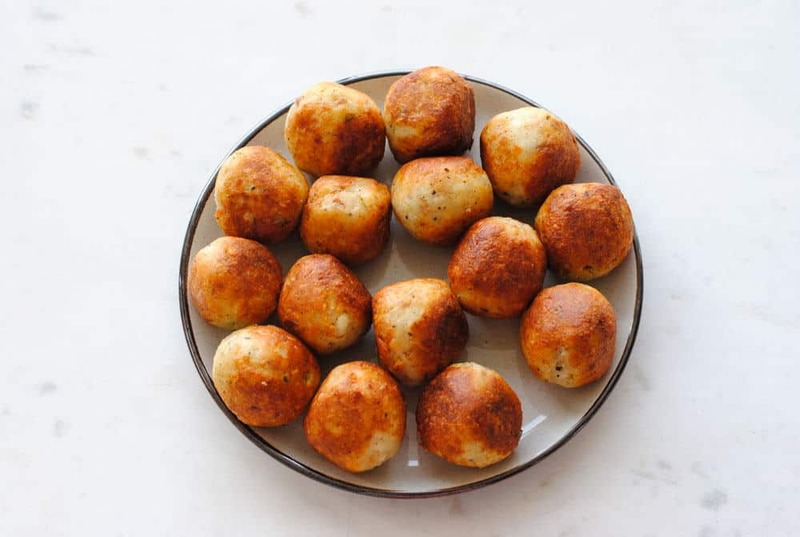 If you’re shallow frying, heat some oil in a pan and fry the balls on medium heat until golden-brown. Turn them around a bit for even browning on all sides. Fry half the onions in oil and grind when cool. Blend the remaining onions, ginger, garlic and cashews to a paste. Fry some whole spices in oil, add the masala (onion-ginger-garlic-cashew puree) and saute on medium heat (bhunao). Add the fried and ground onions and saute again. Add tomato puree, Kashmiri chilli and salt. Cover and cook. When cool, add cream and kasuri methi (fenugreek leaves). 5 ESSENTIAL INDIAN COOKING TECHNIQUES – explains different methods in Indian cooking like baghar, talna, bhunao, dum and dhuanaar. Very useful if you’re new to cooking Indian food. Pour the gravy in a wide and shallow dish and place the koftas in the gravy when ready to serve. Place the koftas in the dish first and then pour the gravy on top of them. As you might have guessed by now, paneer kofta curry is not really a weekday dish which can be whipped out in a jiffy. It does require some work upfront. So, I find myself making it when I’m expecting company or on a particularly leisurely weekend. Do not put the koftas in the gravy beforehand. If there is time between making the dish and serving it, keep the two separate. Assemble them only when ready to serve, or the koftas can break. It’s a good idea to do the grating and grinding in advance. Trying to do everything in one marathon session can be overwhelming even for people familiar with the recipe. Get the grunt work out of the way before you start cooking! 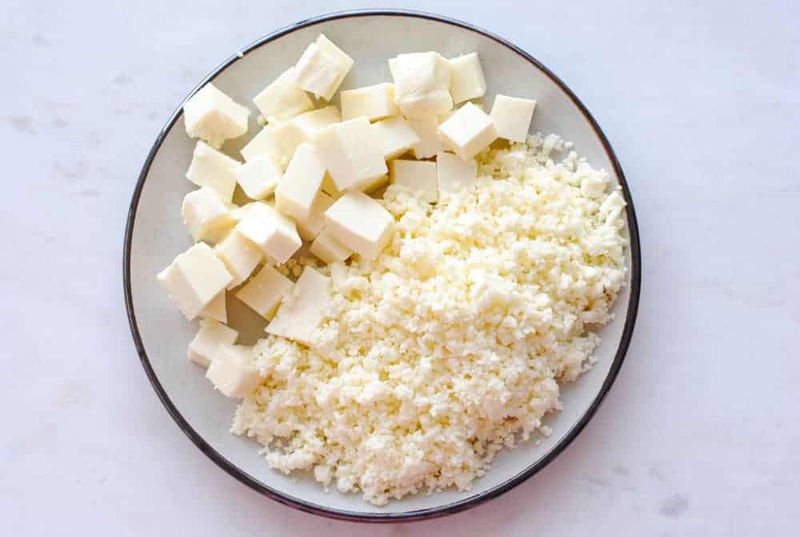 Don’t waste time grating the paneer by hand. Cut the slab into medium sized pieces and grate in a food processor. Make a large batch of koftas in one go. Since you can freeze them, you’re just left with frying them and making the gravy when you want to have malai kofta for dinner. What does malai kofta taste like? I think so! There’s nothing unhealthy in the ingredients or the method if you’re shallow frying the dumplings. I mean, there’s paneer (Indian cottage cheese), potatoes, tomatoes, onions, ginger, garlic, cashews and a few spices that go into making them. Nothing unnatural or processed there. The cream? Well, it’s just two spoonfuls. But if you can’t stand the thought, go ahead and sub with some coconut milk. The gravy will taste just as nice, I promise. What do I eat with malai kofta? It’s a personal preference, actually. I like to have it with Indian bread like naan, but it pairs well with rice too since there’s a gravy. It tastes great both ways. You can even have it solo as a snack if you don’t want to go whole hog, gravy and all. I recommend deep frying the balls in this case since you’ll want them crispy on the outside while still soft and creamy inside. 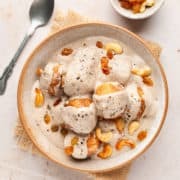 Is it possible to make vegan malai kofta? Of course. Instead of paneer, go for semi-firm tofu and swap the cream for some coconut milk as mentioned earlier. Your vegan version of the dish is ready and it’s just as delicious. 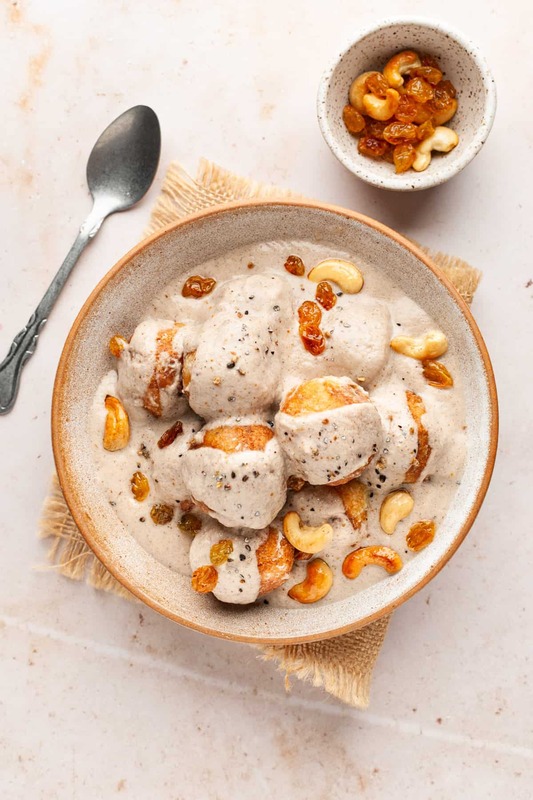 Can I freeze malai kofta? Yes, absolutely. Once your koftas are fried, cool them completely and lay them out on a platter lined with clingwrap. Place the koftas on the platter making sure they don’t touch each other. If you have a lot of koftas, layer them on the same platter with every layer separated by clingwrap. Keep the platter in the freezer. Once the koftas are frozen, take them out and transfer to a ziploc bag. Return the bag to the freezer. Now, when you want to make this paneer kofta recipe, you just have to worry about making the gravy. Malai kofta is a vegetarian delight made of paneer and potato balls in a rich tomato gravy. Smooth, creamy, and oh so delicous! Mix all the ingredients (except the oil) well and shape into balls. Heat the oil in a shallow pan and fry the koftas until golden brown on all sides. Keep aside. Take half of the sliced onions and fry in hot oil until caramelized. Remove with a slotted spoon and grind in a small grinder. 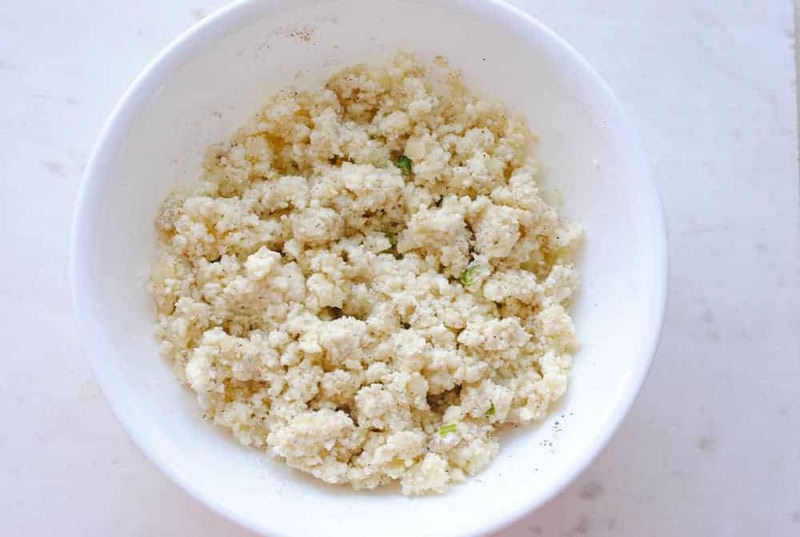 Put the remaining onions, ginger, garlic and cashews in a blender and blend to a fine paste. Heat the oil in a deep pan and add the whole garam masala: black and green cardamom, cloves, bay leaf and cinnamon. When the spices change colour (1 minute), add the onion-ginger-garlic-cashew paste. Saute for 5 minutes on high heat. Add the fried and ground onions and saute for 5 minutes. Tip in the tomato puree, Kashmiri red chilli and salt. Add a glass water and cook covered on medium heat for 20 minutes. When the gravy cools down a bit, add the cream and kasuri methi. Pour the gravy in a wide and shallow dish. Drop the koftas in the gravy one by one, taking care not to pile them on top of each other. Add a small drizzle of cream on top. Serve hot with naan or rice. All the ingredients in the recipe are available easily. Kasoori methi, Kashmiri red chilli (a mild form of red chilli) and paneer (Indian cottage cheese) can be bought from any Indian store, but even these are now available in big chain supermarkets like Walmart. Tomato puree and ginger garlic pastes can be made at home or store bought to save time. 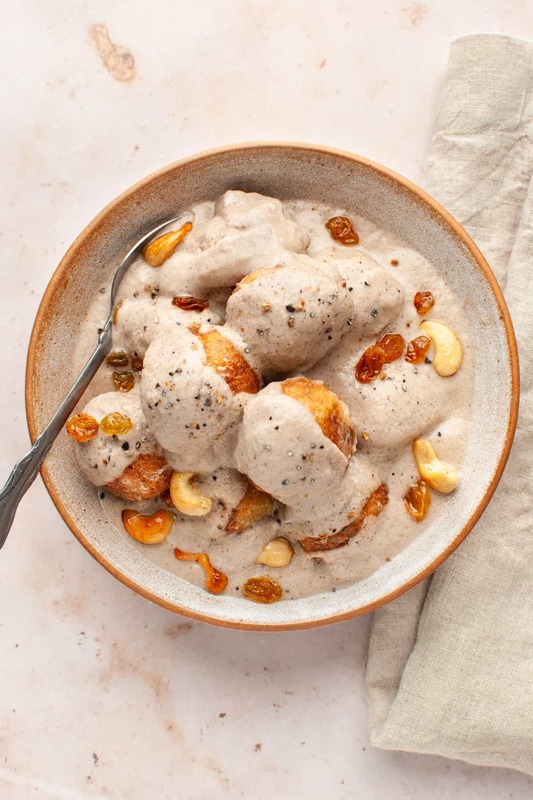 Did you make this malai kofta recipe? Don’t forget to give it a star rating below! Thanks. Hope you enjoy it as much as I do! I’ve had these at restaurants before, never thought I could make it myself! Your directions make these seem totally doable! Oh, yes! It is totally doable at home. Very cool recipe. I have never tried something like this and am excited to see what it tastes like! Delicious I am sure! Thanks Caitlyn. DO try it. I’m sure you won’t be disappointed! I’ve never heard of this dish before, but I love paneer! I don’t have a great Indian restaurant local, but I do have a market that makes paneer in house and I’m always looking for more ways to incorporate it. Malai kofta is one of those very popular paneer dishes that you have to try if you haven’t! Oh yum!! My hubby has been wanting me to make something like this! These look great–I’ll definitely be trying these soon. I’ve never had kofta, but it sounds delicious! We try to eat meatless a couple of times a week so this is going on Sunday’s menu! Yes, it’s the perfect vegetarian meal for a weekend. You do need a little time on your hands to make this, so I almost always do this on a Saturday or Sunday. Love me some vegetarian Indian food and everything with paneer cheese in it is a winner in my book! These kofta look INCREDIBLE and that gravy sounds mouthwatering!SAVED !!! I’ve never had paneer, though I’ve heard it’s delicious. I’ll have to see if I can find some here and make this at home. It does look delicious. I also love the idea of deep frying them and eating them solo! If you haven’t had paneer, you must definitely try this. I love having fried paneer koftas sans gravy too! I don’t know that I’ve ever had these but they look delicious – I’m definitely going to give them at try! I have never had this before, but is sounds delicious. After reading about it, I want to try it real soon! This looks absolutely beautiful! I fell in with paneer when I went to India a few years ago! It’s so delicious and I love how you’ve made them into little balls! Yes, paneer is the kind of food that you can’t help liking! Even if you’ve never had it before, the texture and taste will make you fall in love! This looks so reminiscent of a type of dumpling my husband grew up with in Norway called komle. Of course, your sauce is completely different (they served their dumplings with a beef broth sauce) but it looks divine! I bet both my husband and I would love these. That is so interesting, Claire. Komle…what are the dumplings made of?